All Branch meetings will be on Monday afternoons at 2.00pm at the Presbyterian Church, 43 Ngaio Road, Waikanae unless otherwise stated. For those at Ngaio Road, in-house matters will be dealt with first followed by tea or coffee (gold coin donation appreciated) usually around 2.30 pm. Our guest speaker should commence at about 3.00 pm and be finished by 4.00 pm. Each meeting at Ngaio Road will have the listed in-house competetions. 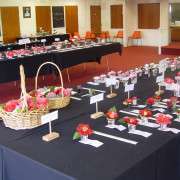 Non-members are cordially invited to bring your blooms of any species from your garden and enter them in the Novice Class between 1.30 pm and 2.00pm.Names are not required but name if you can. A member will be available to assist you. 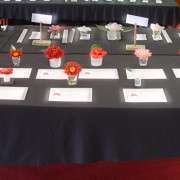 The class will be judged and 1st, 2nd, and 3rd places awarded. If you are not able to bring any blooms, you will still be made very welcome to any of our branch meetings. You will see from the speakers a wide range of subjects are covered. If you have any questions about camellias or other plants bring them along with you. There will also be a sales table and a raffle at each meeting. Monday July 1 Guest speaker: Pam Sinclair, "Towards a p[redator free Kapaiti". 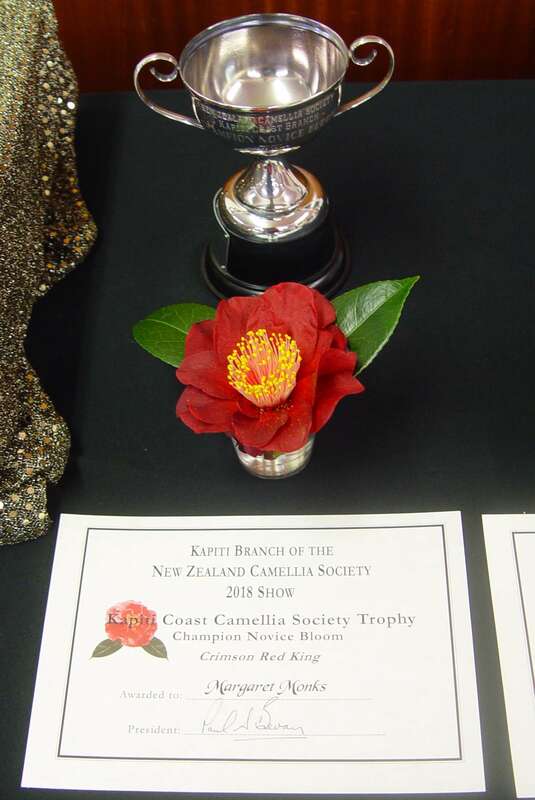 In-house competition; Camellias any variety"
Monday September 2 Guest speaker: Pam Stapleton, "Waikanae Esturay Care Group; Past, Present and Future"
This show will provide the opportunity for everyone to view and exhibit a wide range of camellia blooms in their differing colours, shapes, sizes and species. 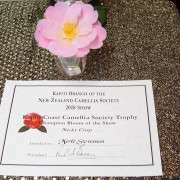 On the Frday, for non-members from 2pm to 4.30 pm bring your camellias from your garden in colours of White, Pink and Red, and variegated, and three of the same and three different colours, and enter them in the Novice Class. A schedule of the Novice classes will be available so you will know which class(es) to enter. A Steward will be available to assist. You are not required to name your blooms, but name if you can. 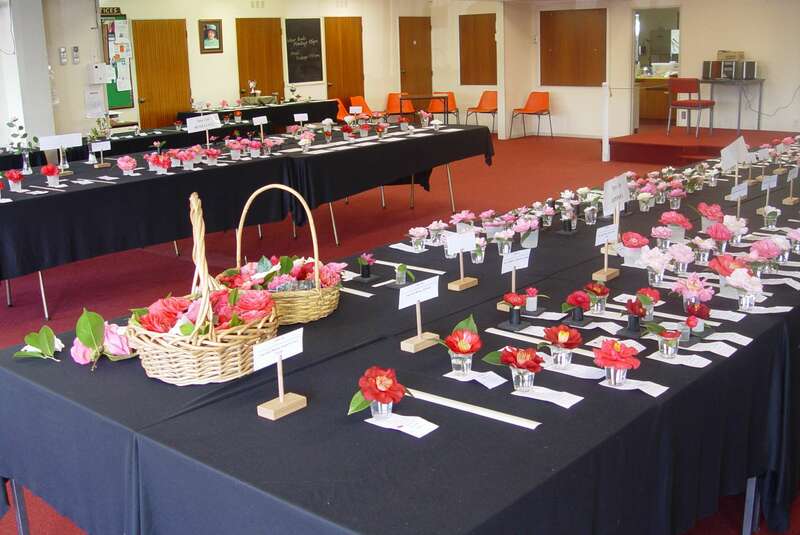 The top three blooms will be awarded 1st, 2nd, and 3rd places. The best bloom in all the classes will win the Champion Novice Class of the show along with a Trophy. The show will open at 11.00am and close at 3.30 pm. There will be a number of stalls including produce, plants camellia products, along with a raffle. 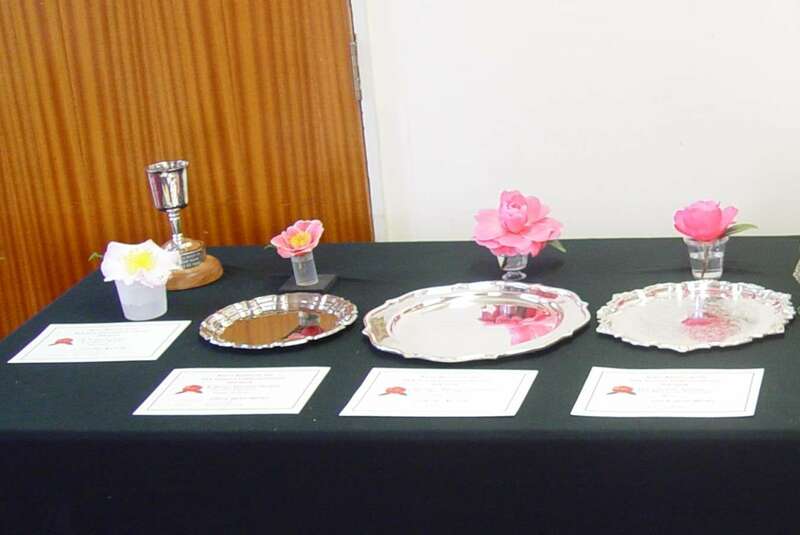 Prize giving for the Champion Bloom of the Show and the Champion Novice Bloom and those premier winners will be at 3.00 pm and the raffle draw at 3.15pm. 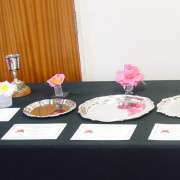 There will be a top table and that is where the Champion and Premier blooms will be displayed. Those blooms will be the outstaning blooms of the show. Come along and have a look. There is an entry fee of $2.00 per person, children free. 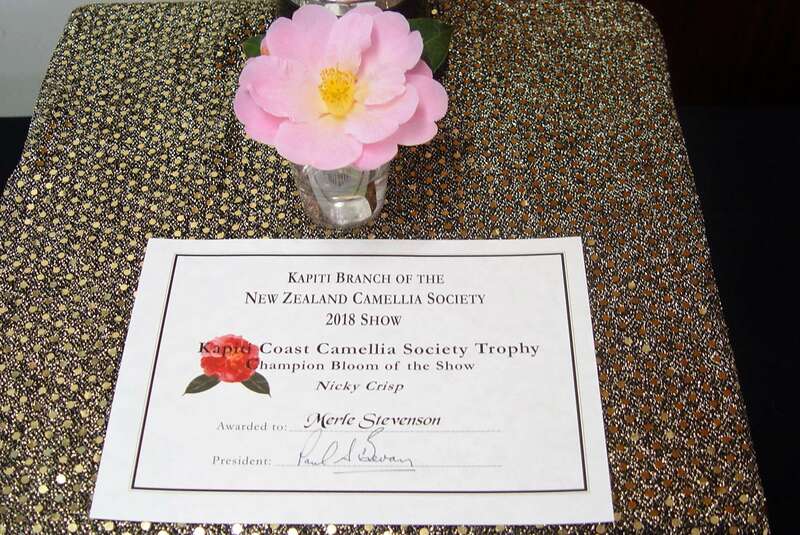 The Champion Bloom in the Novice class was a Nicky Crisp (Pink) won by Merle Stevenson. 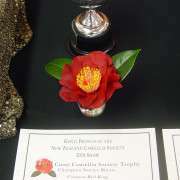 The Champion Bloom of the Show, was an outstanding bloom (Crimsdon Red King) and was won by Margaret Monks.